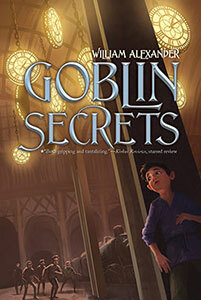 By Carl Slaughter: William Alexander’s debut novel, Goblin Secret, won the National Book Award. His narration of Goblin Secret won the Earphones Award. Ghoulish Song, set in the same universe as Goblin Secret, won the Mythopoeic Award. 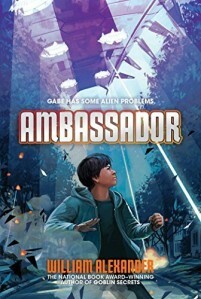 Ambassador won the Eleanor Cameron Award, was nominated for the International Latino Book Award, and was selected by the Junior Library Guild. 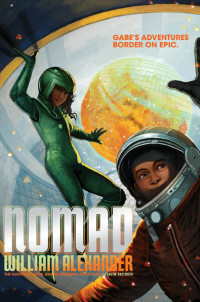 Nomad, the sequel to Ambassador, came out in September. Alexander studied theater and folklore at Oberlin College and English at the University of Vermont. 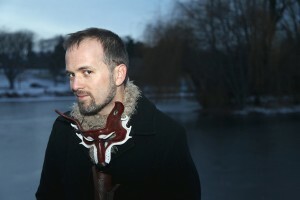 He teaches in the Vermont College of Fine Arts MFA program in Writing for Children and Young Adults. Like the protagonist of Nomad and Ambassador, he is the son of a Latino immigrant to the US. Alexander is a Clarion graduate. All of his books are middle grade. Gabe Fuentes is reading under the covers one summer night when he is interrupted by a creature who looks like a purple sock puppet. The sock puppet introduces himself as the Envoy and asks if Gabe wants to be Earth’s ambassador to the galaxy. What sane eleven-year-old could refuse? Some ingenious tinkering with the washing machine sends Gabe’s “entangled” self out to the center of the galaxy. There he finds that Earth is in the path of a destructive alien force—and Gabe himself is the target of an assassination plot. Exactly who wants him out of the way? And why? Back home, Gabe discovers that his undocumented immigrant parents are in danger of being deported. Can Gabe survive long enough to solve two sets of “alien” problems? He runs for his life, through Minneapolis and outer space. Kaile lives in Zombay, an astonishing city where goblins walk the streets and witches work their charms and curses. Kaile wants to be a musician and is delighted when a goblin gives her a flute carved out of bone. But the flute’s single, mournful song has a dangerous consequence: it separates Kaile and her shadow. Anyone without a shadow is considered dead, and despite Kaile’s protests that she’s alive and breathing, her family forces her to leave so she can’t haunt their home. Kaile and her shadow soon learn that the troublesome flute is tied to a terrifying ghoul made from the bones of those who drowned in the Zombay River. With the ghoul chasing her and the river threatening to flood, Kaile has an important role to play in keeping Zombay safe. Will Kaile and her shadow be able to learn the right tune in time? 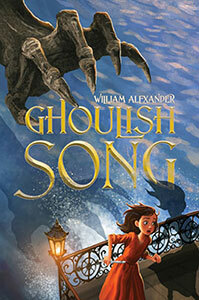 Set in the delightful and dangerous world of Goblin Secrets, Ghoulish Song is a gripping adventure laced with humor and mystery. This entry was posted in Like Show Business and tagged Carl Slaughter, William Alexander by Mike Glyer. Bookmark the permalink. I really enjoy his work. When I have kids come in to the library looking for fantasy, I often recommend his books.